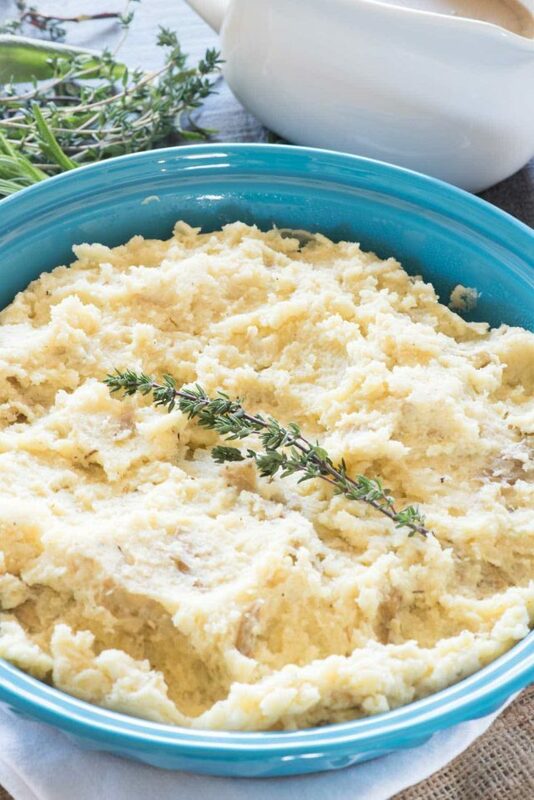 These simple and Easy Crockpot Mashed Potatoes come together in minutes – you set it and forget it so you can make all the other sides! It’s crazy how good they are from the slow cooker! Mashed potatoes are my love language these days, seriously. I think they’re the ultimate comfort food and I guess I’ve been needing comfort lately because all I want is mashed potatoes with gravy. When I was a kid I was never a huge fan of mashed or baked potatoes, probably because they didn’t have tons of butter or garlic or lots of seasoning. I grew up in the 70s and 80s when it seemed like restaurants liked serving bland-ish recipes that were just basic. Nowadays I love ordering mashed potatoes at restaurants (especially steak houses) because they almost always have lots of garlic in them, bonus for CHEESE. What’s funny is that, while I love them, mashed potatoes weren’t part of my holiday traditions growing up. Whenever we had Thanksgiving or Christmas, we served stuffing and knoepfle (a Swiss noodle), not potatoes. When Mel and I got married and he expected potatoes at Thanksgiving I was stumped! 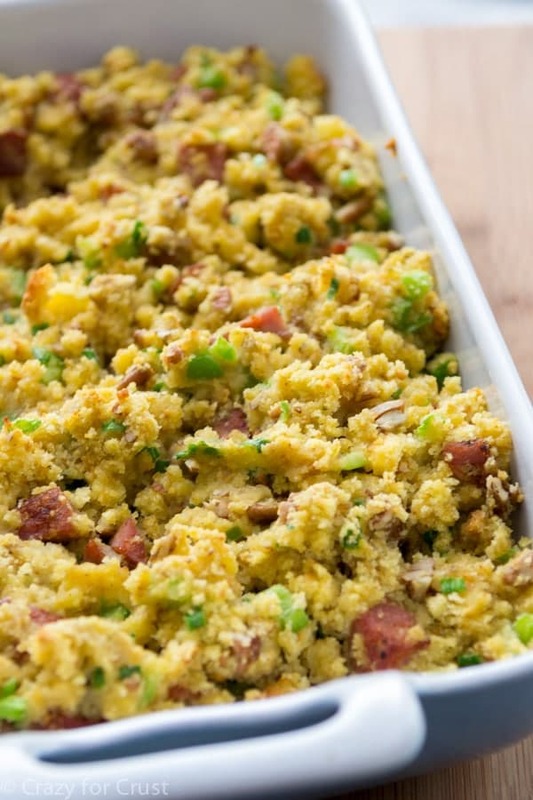 Now, because side dishes are my favorite part of any holiday meal, we make all three. It’s a carb-loading kind of day, except we don’t run a marathon on Black Friday (except the one in Target). As an adult I’ve made lots of mashed potatoes. I’ve made them with garlic, with cheese, with and without sour cream. I’ve made them low fat by skipping the dairy all together and mashing with chicken stock. I’ve made them with skins and without, chunky and smooth, with herbs or with spices. But until this recipe I’ve never made them in the slow cooker. Crockpot mashed potatoes are life changing. I’m just gonna put that out there. I know, you think. How hard is it to cook potatoes? What’s the point of doing it in the crockpot? Well, for one, because you can, and two, because sometimes the stove is too full. At any given time on a holiday my stove is full of a stock pot making knoepfle, a turkey pan, a pot making gravy, and, well, there’s no more standing room to mash potatoes. The slow cooker takes care of the stove problem and you can set it and forget it. Did I mention that it won’t boil over like my stovetop mashed potatoes always do? Without a doubt, I’ll forget I’m boiling water and within a few minutes it floods my stovetop leaving a huge mess to clean up. Slow Cooker Mashed Potatoes take care of that problem. Plus they’re SO GOOD! 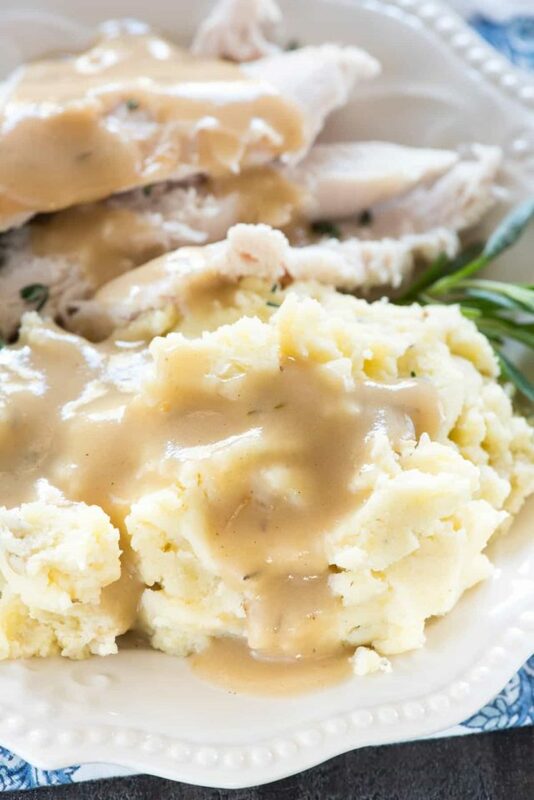 Crockpot Mashed Potatoes are perfect for any meal; they’re easy to prepare and taste delicious! This easy recipe comes from my friend Leigh Anne’s book, Holiday Slow Cooker. It’s a cookbook full of recipes for every holiday, from Thanksgiving to Christmas, Chinese New Year, to 4th of July and everything in between. There are also entire sections on soup, sandwiches, and breakfasts! Leigh Anne is the blogger behind Your Homebased Mom and if you don’t have this book yet you need to grab a copy. I plan to make lots of recipes from it, including her Beef and Broccoli, Brisket, and Lemon Pull-Apart Biscuits. Whether or not you’re making a huge holiday meal you should keep this recipe in your arsenal. It’s easy and totally satisfies your mashed potato comfort food cravings! I used Yukon Gold potatoes for this recipe. Leigh Ann also has a recipe that uses red potatoes, but does not recommend traditional russet potatoes for the slow cooker. You can peel your potatoes or not. I like leaving the peels on because I’m lazy, but I also like the flavor. Cooking your potatoes in chicken stock instead of water adds so much flavor! Crockpots all cook differently. I suggest checking after 2 1/2 hours although they’ll most likely take at least 3 hours. You know potatoes are done and ready to be mashed when they fall easily off a fork when pierced. Feel free to add more of anything to this recipe than I did. If you like them creamier, add more milk or sour cream. Add different spices, herbs, or roasted garlic if you want. Once the potatoes are cooked, they can become anything you want them to be. Slow Cooker (aka Crockpot): get at least a 6-qt one for regular sized meals. Potato masher – to mash the potatoes, of course! Crockpot Mashed Potatoes are easy and such a simple side dish. They come together in minutes while you set it and forget it so you can make all the other dishes you need for your family dinner. The flavor of these is so good, they're full of sour cream and butter and cream cheese! You can peel the potatoes or leave the skins on and clean them really well. (I like leaving my skins on.) Cut potatoes into quarters. Place potatoes in the bottom of a 6-quart crockpot. Add chicken broth just to cover the potatoes. Cover and cook on high 3-4 hours (mine took exactly 3 hours but all crockpots cook differently.) Potatoes are done and ready to be mashed when they fall easily off a fork when pierced. Drain the potatoes (reserve some potato stock if you want to use instead of milk when mashing). Add the butter, sour cream, and cream cheese and mash until your desired consistency, adding milk as needed. (I like my potatoes a bit chunky and less creamy, but everyone likes them their own way.) Add the herbs and more seasoned salt, to taste. Serve hot. Store leftovers in an airtight container for up to 3 days. I was provided a review copy of this book but this post is not sponsored. All opinions are 100% my own. (When it comes to cookbook reviews, I only review the ones I truly love!) This post also contains affiliate links. Hello Dorothy….! 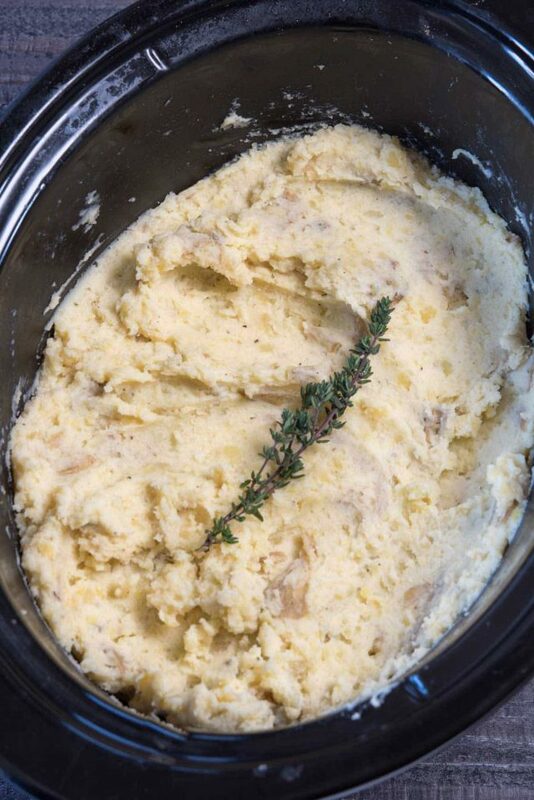 your crockpot mashed patatoes looks so yummy & delicious and this recipe is so simple and easy. Thanks for sharing…! Ok….I never make mashed potatoes. Like ever. So for my future attempt one day I will listen to you and make them in the Crock Pot since they sound so much better that way! I can’t wait to make these! Doing a trial run Sunday with ham, but betting this recipe will be in the “must have” file. I also make our dressing in the crock pot. It’s delicious, and we don’t mind it not being in the bird at all. This is my exact recipe except I’ve never tried chicken stock! Can’t wait to try that. 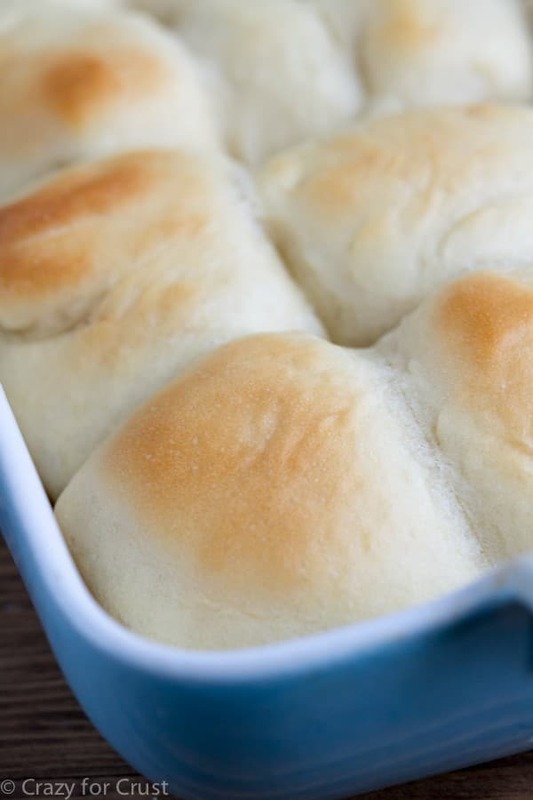 Have you ever used brown butter instead of just regular? That makes it also very yummy.